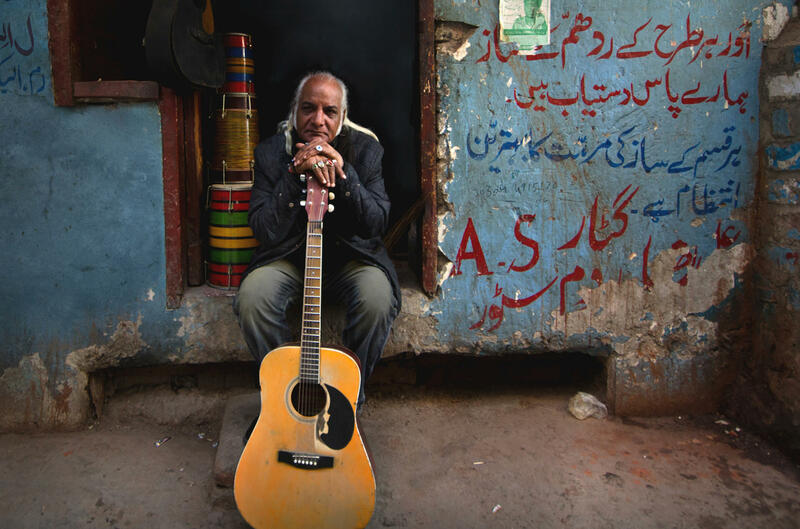 Asad Ali, 63, was unemployed for four years when Pakistan clamped down on live music in 1977. He now plays the guitar for Sachal Studios Orchestra around the globe and in his hometown, Lahore. Saleem Khan, 65, teaches his grandson how to play the violin in their home in Lahore. Oscar-winning filmmaker Sharmeen Obaid-Chinoy, left, co-directed Song of Lahore with producer Andy Schocken, right. In his home in Lahore, Pakistan, Saleem Khan holds up his late father's violin. There are no strings, the wood is scratched and the bridge is missing. "There was a time when people used to come to Lahore from all over the world to hear its musicians," the 65-year-old violinist says in the new documentary, Song of Lahore. "Now we can't even find someone to repair our violins." Pakistan's second-largest city once had a booming film industry and a flourishing music scene. Classical musicians, with their tabla drums, violins and sitars, would perform on stage, in movies and in crowded markets. Then in 1977, Pakistan's sixth president, General Muhammad Zia-ul-Haq, clamped down on the film and music industry. That left classical musicians like Khan struggling to get by. Many of his fellow artists fell into poverty. Today people mostly tune into pop music, says Sharmeen Obaid-Chinoy, an Oscar-winning filmmaker and journalist based in Karachi and a director of the film. Classical music in Pakistan has virtually died, she says. But seven musicians in Lahore are trying to change that, one performance at a time. 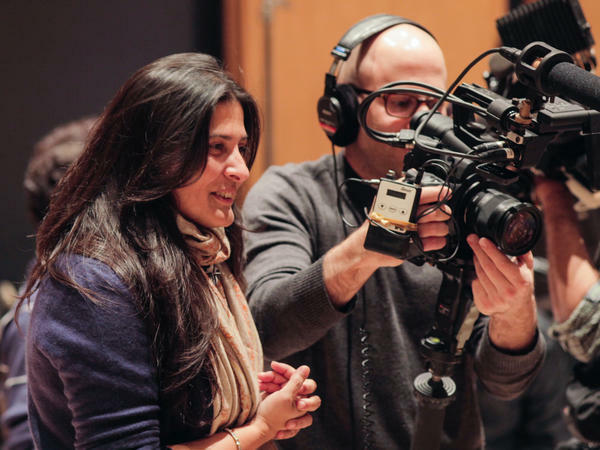 Obaid-Chinoy's film follows the musicians on their quest. The documentary premieres Saturday at the Tribeca Film Festival in New York City. The musicians are part of Sachal Studios Orchestra, a group of about 20 Lahore-based artists who fuse traditional Pakistani music with jazz. They work in a small rehearsal room in Sachal Studios, at the heart of the city. There, they create new songs and rehearse for concerts in effort to keep traditional music on the public's radar. When they started in the early 2000s, the ensemble went largely unnoticed. Then in 2014, they performed in New York City with Wynton Marsalis and Jazz at Lincoln Center Orchestra. This appearance earned them recognition in the global jazz scene. Since then, they've been performing around the globe and in Pakistan. The documentary zooms into each musician's personal life before their success. For example, 39-year-old Nijat Ali is tasked to take over as conductor of the ensemble when his father dies. Saleem Khan, the violinist, struggles to pass on his skills to his grandson before it's too late. And 63-year-old guitarist Asad Ali tries to make ends meet by playing guitar in a local pop band. The biggest challenge, Obaid-Chinoy says, was getting them to open up. "The musicians are very proud," she tells Goats and Soda. "When I first began filming them, they hid how tough life was for them, and it took me a long time to pry that open." For the 36-year-old journalist, the three-year project hits close to home. "I grew up with my grandfather's stories of a very vibrant Pakistan, where on the streets [of Karachi] you would have bands playing," she says. "When I was young I would watch [the performances] on television. But when I was a teenager, all of that was lost, and I never experienced the appreciation that he did." The film is co-directed by filmmaker Andy Schocken. He wants the video to show people in the West a different side of Pakistan. "Typically, people only see stories about terrorism and sectarian conflict," he says. "So it's important for us to show that there is a culture there worth preserving, and these are the people fighting for it." Obaid-Chinoy remembers worrying if people would show up to the group's first free concert back in Pakistan. They had played sold-out shows in New York City, but could they fill a 1,000-seat auditorium in Lahore? She took her cameramen outside just five minutes before doors opened. "As far as my eyes could see, there were hundreds and hundreds of people lining up — I mean a sea of people," she says. "That was when I said, 'Well, the musicians have come home.' "